Two sol–gel materials based on tetraethylorthosilicate (TEOS) and a combination of methacryloxypropyltrimethoxysilane and zirconium propoxide were developed and used as host matrices for the organic catalyst (l-proline) and iron oxide nanoparticles with the objective of formulating a magnetic sol–gel catalyst. In order to investigate the effect of the sol–gel condensation process on the catalyst recyclability and the effect of the dopants on the structure of the sol–gel matrices, iron oxide nanoparticles and l-proline were introduced in the sol–gel matrices either during the sol–gel synthesis or at the end of the sol–gel synthesis. While both systems were successfully recycled three times when applied to the Aldol reaction, the TEOS based sol–gel material with the dopants introduced at the end of the sol–gel synthesis showed excellent reaction efficiency and recyclability with 99% conversion. In parallel, the zirconium sol–gel-based material did not enable any conversion. Remarkably, it is demonstrated that the process of introducing the dopants strongly effects the condensation of the inorganic networks of the sol–gel matrix by involving the organic catalyst in the catalysis of the condensation of the inorganic moieties. Furthermore, this condensation process is shown to play a major role in the mobility of the organic catalyst and therefore on its ability to be recycled. This study is, to our knowledge, the first that investigates the effect of the morphology and structure of sol–gel matrices on the catalytic performance of an organic catalyst. Since its discovery in 1872 by Charles-Adolphe Wurtz and Alexander Borodin the aldol reaction has been one of the most useful reactions in organic synthesis. By combining two carbonyl units, the reaction affords β-hydroxyketones which can possess up to two stereo centres. These compounds are found both naturally in polyketides and gingerol or can be prepared synthetically in compounds like atorvastatin (Lipitor)—used in the treatment of blood cholesterol and hydrocortisone—a steroid hormone amongst many others [1, 2, 3, 4, 5]. One of the most commonly used catalysts for such reactions includes l-proline due to its inexpensive and environmentally safe nature [6, 7, 8]. While there have been many improvements to l-proline catalysed aldol reactions through the synthesis of efficient l-proline derivatives, further optimisation by incorporating magnetic properties to non-magnetic catalysts is of interest as the potential to reuse and recycle catalysts is one of their most desirable features [9, 10, 11, 12]. For this reason, magnetic nanoparticles in the form of magnetite (Fe3O4) offer the possibility to be used as magnetic supports due to their high surface area, dispersibility and simple separation from reaction media with the aid of a magnet  In order to combine these magnetic properties to proline, a linker is also needed. This linker is required to be stable under the desired reaction conditions and act as a scaffold to which dopants may be incorporated. Owing to their excellent chemical stability within the aldol reaction and ability to encapsulate and entrap dopants, sol–gels are seen as having the potential to provide the necessary support needed so that a magnetically recoverable organocatalyst may be prepared. This paper investigates the efficiency of inorganic scaffolds made from hybrid sol–gel precursors in order to prepare recyclable magnetic catalysts and the effect the morphology of the sol–gel materials provides on the catalysts recyclability. To this end, sol–gel materials with different structures and morphologies based on an organically modified silicate (ormosil) and a combination of an ormosil and a transition metal complex have been prepared and characterised. The structure of the sol–gel materials are characterised by FTIR and NMR spectroscopies and their abilities to act as catalytic host matrices evaluated through aldol reactions. This study is the first, to our knowledge, that investigates the effect of sol–gel matrices on the catalytic ability and recyclability of l-proline in the aldol reaction. Two series of materials employing hybrid silicates only (SG1 series) and hybrid silicates along with a transition metal complex (SG2 series) were prepared. 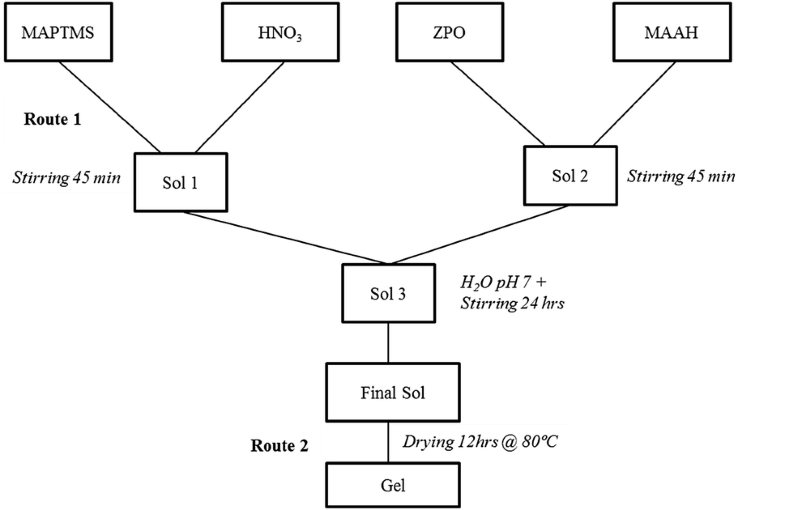 In addition, to alter the structure and morphology of the host sol–gel matrices and identify the effects this produces on the catalyst conversion two sol–gel routes were established where the dopants (l-proline and iron oxide) are incorporated within the sol–gel materials at different stages of the synthesis, as sketched in Fig. 1. For both series of materials a non-doped material (SG1 and SG2) was prepared as a reference. In route 1 (material SG1A), tetraethoxysilane (TEOS Aldrich, 99%) is mixed along with the catalyst and iron oxide nanoparticles (Fe3O4) followed by a hydrolysis employing an aqueous solution of nitric acid (0.1 M) to enable the formation of the inorganic network. After 10 min of stirring, absolute ethanol (5 ml) was added drop wise to minimise the kinetic of condensation of the silicate species and maintain a homogenous sol,as then left to stir for 15 h to enable further continuation of the sol–gel condensation reactions. Following this ageing step, the solvent is removed in vacuo and the obtained solid phase dried in an oven at 80 °C for 12 h. The solid material is then ground into a fine powder and used as prepared. In route 2 (material SG1B), TEOS is first hydrolysed employing an aqueous solution of nitric acid (0.1 M) to enable the formation of the inorganic network. After 10 min of reaction, absolute ethanol was added drop wise and the solution left to stir for a further 20 min. To this sol, iron oxide nanoparticles and l-proline were added and the mixture was allowed to stir for 15 h. The obtained sol was then dried in an oven at 80 °C for 12 h and the final solid material ground into a fine powder and used as prepared. The proportions of the materials employed in these preparations are detailed in Table 1. SG2 materials series were prepared from the mixture of an organosilane precursor (3-methacryloxypropyltrimethoxysilane, MAPTMS, Assay _99% in methanol, Aldrich) and a zirconium complex, prepared from the chelation of zirconium (IV) n-propoxide (ZPO, Assay 70% in propanol, Aldrich) by methacrylic acid (MAAH, C4H6O4, Assay > 98%, Aldrich). The choice of MAAH as a ligand chelating agent for ZPO was based on previous studies where this ligand was found to be the most adequate amongst a series of ligands used in the chelation of ZPO . The formulation of SG2 materials series is summarised in Table 2. The sol–gel synthesis was performed in a three-step process employing MAPTMS (3-methacryloxypropyltrimethoxysilane, Assay 99% in methanol, Aldrich) and ZPO (zirconium (IV) n-propoxide, Assay 70% in propanol, Aldrich) as alkoxide precursors and MAAH (methacrylic acid, C4H6O4, Assay > 98%, Aldrich) as a complexing agent to the ZPO, as sketched in Fig. 2. For SG2A the iron oxide nanoparticles and l-proline were added to the MAPTMS prior to hydrolysis, in the same chemical quantities as for SG1 series. For SG2B, the iron oxide nanoparticles and l-proline were added at the end of the sol–gel synthesis, also in the same chemical quantities as SG1 series. In both cases, the prepared sols were allowed to stir for 15 h. The obtained sols were then dried in an oven at 80 °C for 12 h and the final solid materials grounded into a fine powder and used as prepared. To a solution of 4-nitrobenzaldehyde (0.2 g, 1.32 mmol) dissolved in acetone (5 ml) was added the equivalence of 20 mol% of l-proline catalyst from the prepared SG1A, SG1B, SG2A and SG2B samples (Table 3). The reaction was left to stir for 15 h after which the reaction medium was decanted employing an external magnet. The starting material was re-added and the reaction repeated. The catalyst was reused three consecutive times. FTIR spectroscopy is employed to identify the vibrational modes of the different chemical groups present in the sol–gel materials. 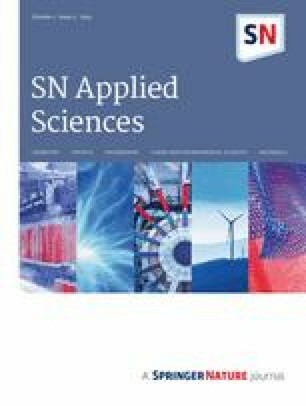 More specifically for the current study, it is expected to shed light on the possible differences in terms of degree of condensation of silicate networks depending on the chemical route and employed precursors. FTIR spectra of all coatings were recorded employing a Perkin Elmer GX instrument operating in the ATR mode within the 600–4000 cm−1 spectral range. The 29Si-NMR spectra were recorded on liquid solutions at room temperature employing a 400 MHz BRUKER spectrometer. Experimental acquisition conditions are as follows: frequency 46.69 MHz, recycle delay 4 s, pulse π/3 (8 μs), spectral width 500 ppm and 80 scans. The signal chemical shift reference was tetramethylsilane and the FID (free induction decay) processing used a 10 Hz line broadening. Dimethyl sulfoxide was used as the lock solvent. With these conditions, spectra with good signal-to-noise ratios were obtained. SEM images and EDX analyses were recorded employing a Hitachi SU-70 SEM using an accelerating voltage of 5–15 keV for SEM images and 15 keV for EDX analyses. Prior to analysis, the samples were coated with approximately 25 nm of carbon using a Cressington 208HR sputter coater to make the sample conductive and to minimise charging during image recording and elemental analyses. 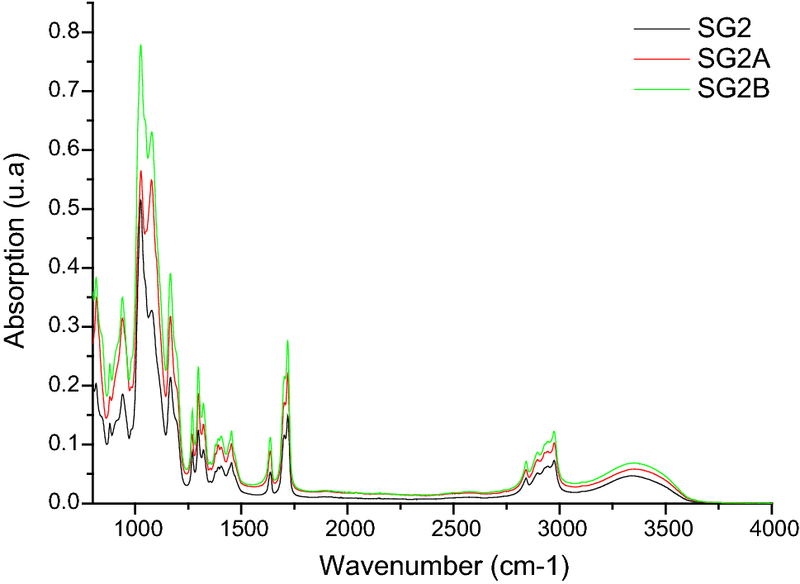 FTIR spectra for SG1 materials series are presented in Fig. 3. If the same chemical vibrations are observed, their relative contributions and distributions may be relying on the formulations. To better appreciate the impact of the stage of incorporation of the dopants (proline and iron oxide) within the sol–gel matrixes and the impact they have on the condensation of the inorganic network, a greater focus on the vibrations of the inorganic groups is required, namely the siloxane (Si–O–Si) and silanol (Si–OH) groups, typically located in the range 800–1200 cm−1, as shown in Fig. 3. All absorption bands were ascribed based on results reported in closely related materials [15, 16, 17]. The large band located in the range 3200–3600 cm−1 is assigned to the vibration of the silanol groups. The three bands observed between 2890 and 2977 cm−1 are attributed to the asymmetric stretches C–H. The bands located at 881 and between 1040 and 1050 cm−1 are ascribed to the linear siloxane groups. The band located in the range 960–970 cm−1 is attributed to the asymmetric stretching of the silanol groups, inherent to the uncondensed silicate species. The bands located in the range 1070–1100 cm−1 are ascribed to the tetrahedral silicate units, which represent the highest condensed silicate moieties . The band located at 1170 cm−1 represents the asymmetric vibration of the residual unreacted ethoxysilane bonds present in the silane precursor. The bands observed between 1350 and 1480 cm−1 are due to the asymmetric deformation of the C–H groups. The large band located in the spectral range 1610–1650 is attributed to the asymmetric stretching of the carbonyl group contained in the l-proline . The different bands observed are presented in Table 4. One can observe that except for the C=O bond that is not observed for SG1, spectra recorded for SG1 and SG1B show the same vibrations with negligible differences. This proves that the incorporation of the dopants at the end of the synthesis does not provoke any significant alteration of the structure of the silane host matrix. However, when SG1 is compared to SG1A, a number of differences can be identified. First, one can clearly see a difference in the distribution and position of the bands attributed to the silicate network, the most significant of those are the intensities of the bands related to the tetrahedral and linear siloxane bonds. Indeed, in the case of SG1A, the bands related to the linear siloxane bonds (at 1040 cm−1) are clearly dominating the tetrahedral ones (1085 cm−1). The band located at 881 cm−1 also representative of the linear siloxane bonds is also seen to show a strong intensity with a sharp form. Unlike SG1A, the tetrahedral siloxane bond at 1075 cm−1 is clearly dominating the linear siloxanes ones. Moreover, an additional tetrahedral siloxane bond vibration is observed at a higher energy (1100 cm−1) for SG1B, suggesting that SG1A limits the formation of a high energy silicate network and thus the structuration of the silicate network. These observations are further confirmed by the weaker intensity of the linear siloxane vibration located at 881 cm−1. These results suggest that SG1A is formed by a silicate network mainly composed of linear chains with a porous morphology and SG1B formed by a denser silicate network mainly composed of tetrahedral units. Therefore, the stage where the dopants are introduced within the sol–gel matrix can have an effect on the morphology of the sol–gel material. Interestingly, the C=O band of the l-proline is seen to undergo a shift towards the higher energies, typically from 1610 to 1650 cm−1 in materials SG1B and SG1A, respectively. This clearly suggests either a chemical reaction between the matrix or a greater stress on the organic molecules. In both case, the link between the l-proline and the sol–gel matrix is stronger in SG1A than in SG1B. When overlapping this result with the morphology of both sol–gels, one can conclude that the condensation of the inorganic network is not the major factor governing its reactivity with the organic dopant but probably more the stage of incorporation of the organic dopant. Indeed, in SG1A, the dopant is inserted at the initial stage of the sol–gel synthesis during the formation of the inorganic backbone. This means that the dopant is likely entrapped by the growing silicate network. In SG1B, the dopant is inserted at the end of the sol–gel synthesis, when the formation of the inorganic network is complete, thus likely to be located at the surface of the inorganic particles. 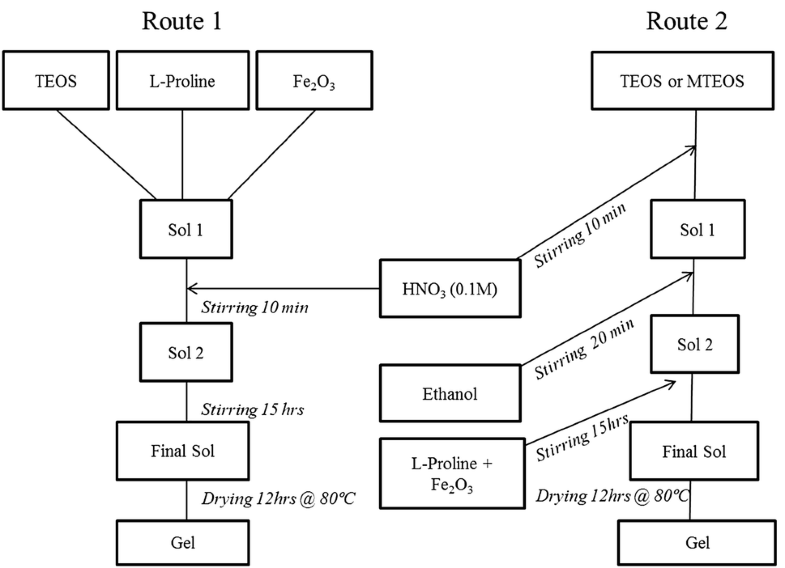 These differences in the interactions between the organic dopant and the sol–gels may be reflected in the recyclability study. 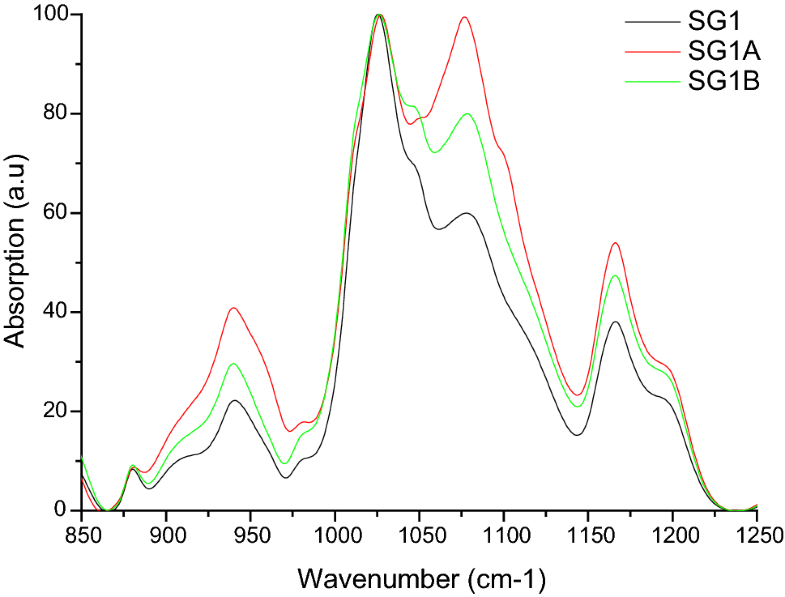 The FTIR spectra for SG2 materials series are presented in Fig. 4. 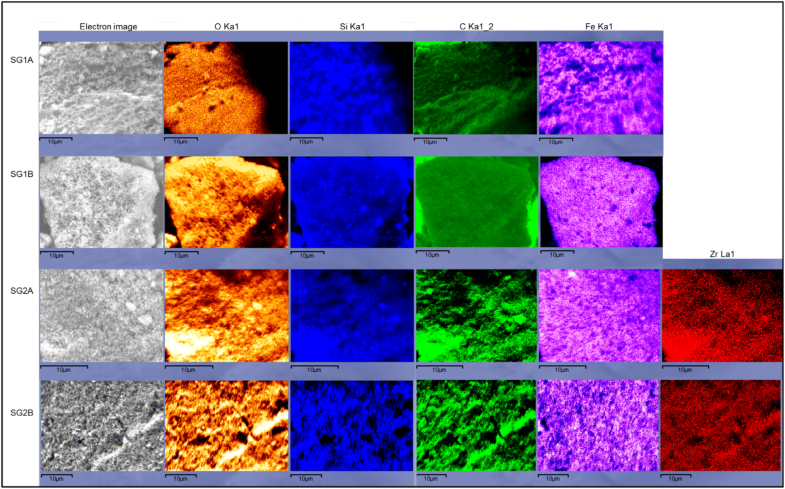 Similarly to the analysis performed for the SG1 materials series, the effect of the stage of introduction of the dopants on the siloxane (Si–O–Si) and silicon-zirconium oxide (Si–O–Zr) moieties is also investigated. To do this, focus on the characteristic groups of the inorganic network is required. 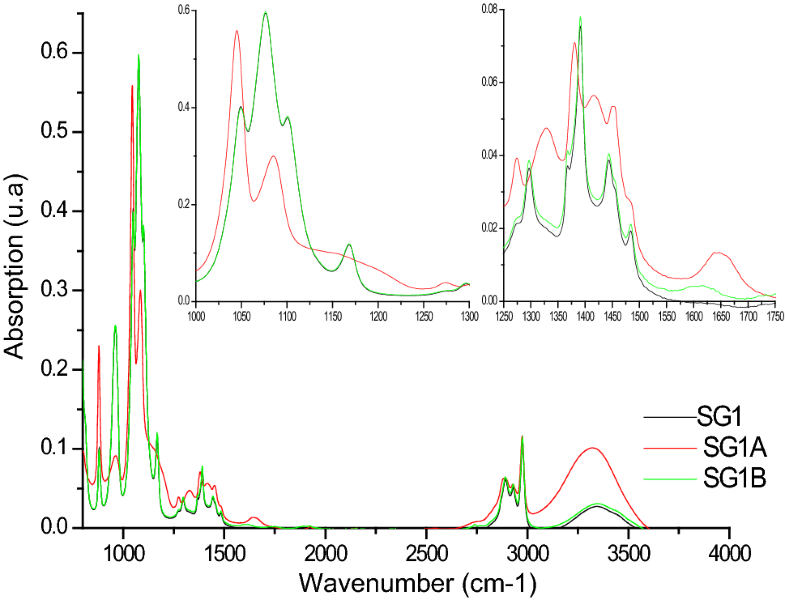 For this reason, normalised FTIR spectra ranging from 850 to 1250 cm−1 are shown in Fig. 5. The broad band located in the range 800–1100 cm−1 results from the superimposition of the Si–O–Si (νs and νas at 840 cm−1 and 1000–1100 cm−1, respectively), Si–O–Zr (νs 940–950 cm−1) and Si–OH (νs 890 cm−1) stretching vibrations. The methoxysilane (Si–O-C) symmetric vibrations contained in the MAPTMS are located at 1170 cm−1. Although the large band located in the 1000–1100 cm−1 spectral range represents the asymmetric siloxanes vibrations, in this region four superimposed bands can be distinguished at 1025, 1050, 1075 and 1100 cm−1. One can observe that while the absorption of the linear Si–O–Si units is at 100% for all materials, the Si–O–Si tetrahedral units (1075 cm−1) increase progressively from SG2, SG2B to SG2A. In parallel, the intensity of the Si–O–Zr bonds (940 cm−1) and the intensity of the residual unreacted Si–O–C groups (1170 cm−1) are also seen to increase in the same order. These results mean that the insertion of the dopants at the beginning of the sol–gel synthesis favours the formation of highly condensed species while also reducing the hydrolysis of the methoxy groups. In other words, l-proline favours the condensation process of the highly condensed silicate species and this process is more significant when l-proline is added at the beginning of the sol–gel synthesis. Importantly, the opposite phenomenon was observed for series SG1, where it was found that the introduction of l-proline at the beginning of the sol–gel synthesis decreased the content of tetrahedral silicate units. This clearly indicates that l-proline interacts with the zirconium complex in such a manner that the formation of high energy silicates units can be formed irreversibly. The most likely chemical reactions taking place are summarised in Schemes 1, 2, 3 and 4, as follow. Nevertheless, if the formation of high energy silicate units is confirmed by FTIR spectroscopy, these results do not provide indication on the content and nature of the condensation degree of the silicate species formed through catalysis by l-proline. To do this, it is proposed to perform 29Si-NMR analyses of both doped and undoped samples prepared with the SG2 materials series. 29Si-NMR spectra for material series SG2 recorded at the end of the synthesis are presented in Fig. 6. 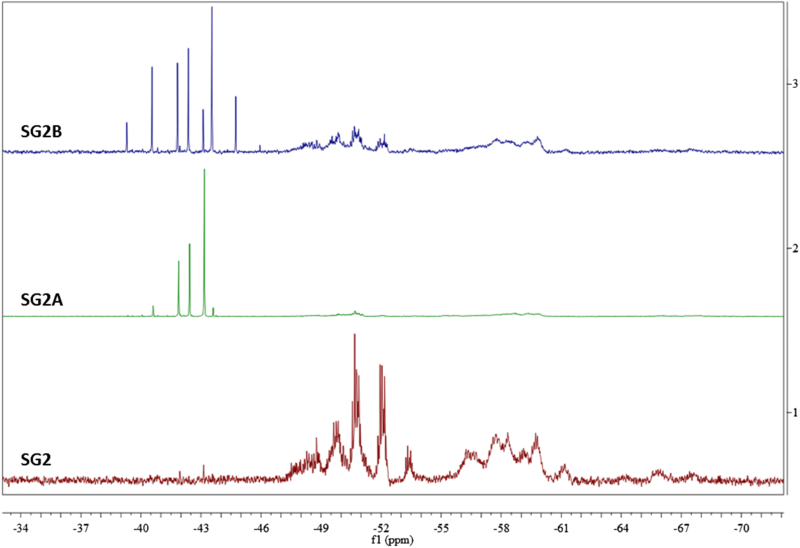 Knowing that the 29Si-NMR spectra of the pure MAPTMS exhibits a single sharp peak at − 42.7 ppm (not shown here), the presence of different chemical shifts in the T0, T1, T2, and T3 regions clearly translate the occurrence of condensation reactions of the methoxysilane groups of the MATPMS. In order to better quantify the concentration of the different formed T species for each materials, the signals of each species were integrated and their relative proportions plotted in Fig. 7. One can observe that T0 groups are minimum for SG2 (1%) and maximum for SG2A, found to be at a content of 36%. this signifies that SG2 would have the highest reactivity. However, it is found that the content of T1 and T2 species is maximum for SG2, with a total content of 96%. It is also found that SG2A shows 59% and SG2B 81%. 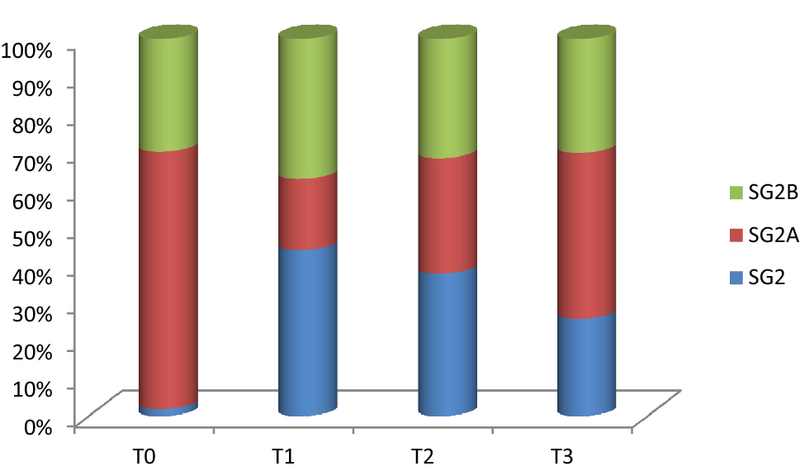 However, the content of the highest T3 species, which are the mostly condensed silicate species are maximum for SG2A (5%), while they are found to be at 3 and 3.5% for SG2 and SG2A, respectively. These results highlight that the incorporation of the l-proline at the beginning of the synthesis favours the formation of highly condensed species, while also maintaining a high content of condensed species. This result is in agreement with the FTIR results where it was found that the high-energy silicate species (bands > 1010 cm−1) where favoured with a high content of non-condensed species (band at 1170 cm−1). The mechanistic model proposed in Schemes 1, 2, 3 and 4 further confirm this. In addition, the fact that T0 groups are minimum for SG2 while its T3 groups are minimum tends to confirm that the structure of its inorganic network would be more linear than SG2A. The intermediate situation for SG2B in terms of content of T0 and T3 definitely indicates that the l-proline has an effect on the condensation of the inorganic network but this effect is less pronounced when incorporated once the formation of the backbone is complete. Owing to these results, it is very likely that l-proline is encapsulated within the inorganic network in both SG2A and SG2B but probably at a lesser extent in SG2B. In order to measure and compare the effectiveness of the formulated sol–gel systems as potential scaffolds for dopant retention, the percentage conversion for three consecutive cycles of the aldol reaction was measured using 1H NMR spectroscopy. By setting up a simple aldol reaction between 4-nitrobenzaldehyde and acetone using the l-proline containing sol–gel catalysts possessing 20 mol% of the active catalyst (Scheme 5), the percentage conversion of aldol product from the aldehyde starting material could be determined and is presented in Table 5 for the three consecutive cycles. The first step involved synthesis of the aldol product independently of the sol gel framework and identification of a potential proton whose change in the integration ratio could be followed using 1H NMR in a crude solution. The proton chosen appeared at 3.97 ppm and corresponded to the aldol product proton. Upon reaction completion, the magnetic sol gel catalysts were recycled with the aid of an external magnet and reused three times. Fresh starting material was added prior to reaction re-initiation and the decanted reaction medium examined using 1H NMR. The initial reaction cycle was shown to vary significantly depending on the structure of the sol–gel material and on whether the catalyst was introduced at the beginning or at the end of the sol–gel synthesis. Indeed, in the case of SG1 series, sol–gel route 1 offered only a 17% conversion in contrast to route 2 with 100% conversion in the first cycle. Once the reaction was stopped, an external magnet was applied to the side of the reaction vessel and the reaction medium efficiently decanted. The starting material was re-added and the reaction repeated. The second and third cycles showed 99% conversion for SG1B demonstrating excellent recyclability, while SG1A showed 8 and 0% recyclability after the same number of cycles. Importantly, for SG2 material series no recyclability was possible regardless of the stage of introduction of the organic dopant. Therefore, for this series of materials, two phenomena are possible. The first is that the l-proline has been embedded within the inorganic sol–gel networks. In this case, the aldol reaction is prevented for accessibility reason. This hypothesis would suggest that the inorganic network is strongly connected with a dense morphology. The second possible phenomenon is that the catalytic activity of the l-proline has been deactivated by the presence of the zirconium complex. Taking into account the FTIR and 29Si-NMR results, where it was shown that the l-proline catalyses the condensation of the silicate species via interaction with the zirconium complex, l-proline can indeed be immobilised by the zirconium atom via formation of covalent bonds between the organic compounds and the d-orbitals of the transition metal, as previously shown with different amino-based systems . Although, the most likely phenomenon would be the embedment of the l-proline within the inorganic network, the chemical reaction with the zirconium complex is a viable phenomenon that cannot be discarded and it would be difficult to clearly discriminate one over the other phenomenon with the experimental techniques used here. The l-proline catalysed aldol reaction begins with enamine formation through a carbinolamine. Here, the lone pair of electrons on the nitrogen of the l-proline attacks the carbonyl carbon of the acetone pushing the electrons up onto the oxygen (Scheme 6). A proton is then transferred from the l-proline onto the oxygen forming a carbinolamine. This is followed by the elimination of water which leads to the formation of an iminium ion, a zwitterionic intermediate. This intermediate is stabilised through tautomerisation where a proton migrates from the alkyl group of the imine to the nucleophilic carboxyl oxygen forming an enamine in the process. Once the enamine has formed, the second step of the process consists of the aldol addition through the nucleophilic attack of the enamine onto the carbonyl carbon of the aldehyde reforming an iminium ion (Scheme 7). This step is also accompanied by hydrogen transfer from the carboxylate onto the oxygen of the aldehyde. The final step of the reaction consists of hydrolysis of the iminium ion leading to the formation of the aldol product and regeneration of the l-proline catalyst (Scheme 8). 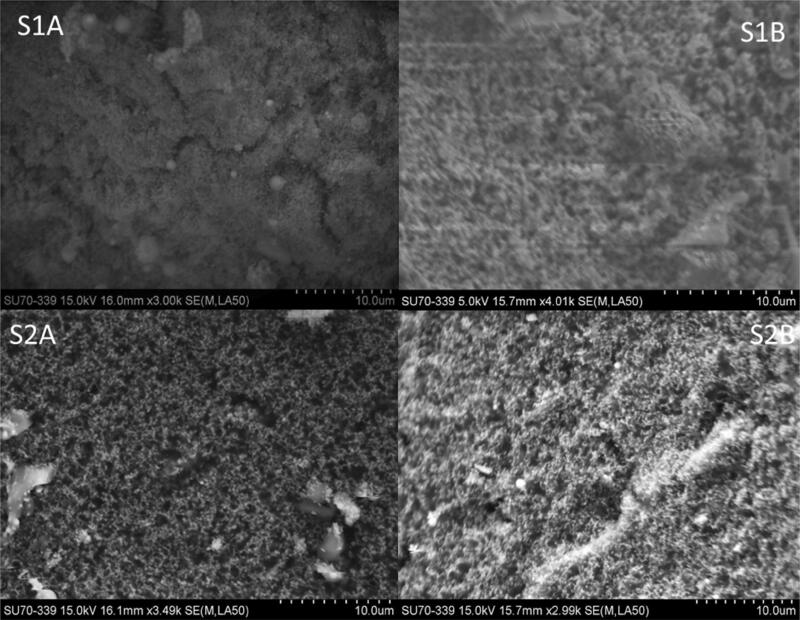 Figure 8 represents the SEM images of all prepared sol–gel materials doped with both l-proline and iron oxide. One can see that all materials are composed of agglomerated sub-micron particles, probably in the range 50–100 nm. As all materials exhibit similar morphologies, one can conclude that the effect of the composition or the synthesis route (1 or 2) has primarily a strong impact on the structure of the particles themselves, as demonstrated by FTIR results, but has negligible impact on the size and aggregation of the particles between each other. Indeed, in sol–gel systems, this latest phenomenon is mainly due to the gelation and solidification processes that take place during the drying and curing steps. Elemental analyses performed by EDX are presented in Fig. 9. One can see that SG1 series are composed of a homogeneous distribution all across the analysed samples of the constitutive elements of the sol–gel precursor (Si, C and O) along with iron. Except of nitrogen, which was impossible to detect with this technique, the catalyst contains C and O, which are common to the sol–gel matrix and cannot be distinguished from the sol–gel matrix. In addition to the elements found for SG1 series, analyses of SG2 series enabled to identify the presence of Zr, which is found to be homogeneously dispersed in the samples and overlapping with the signal of the Si element, thus suggesting the preparation of a highly homogeneous sol–gel matrix where the iron is uniformly distributed. Similarly to the analysis of SG1, it is impossible to clearly evidence the presence of the catalyst but according to the catalyst performances identified above, one can confidently suggest that its constitutive elements C and O, overlap with those of the sol–gel matrix. Therefore, the morphology and elemental analyses cannot explain the difference in terms of catalysis performances identified above and confirm that the structures of the materials is the essential factor governing this phenomenon. Sol–gel matrices with different structures and morphologies have been developed and applied as host matrices for an organic catalyst. The TEOS based sol–gel matrix was used successfully in catalysing the aldol reaction and was subsequently cycled three times with a recyclability conversion of 99%. The zirconium sol–gel matrix did not show any recyclability of the organic catalyst. These results demonstrated that the structure of the sol–gel matrix plays an active role in the catalytic ability of the organic catalyst. The FTIR and 29Si-NMR results have clearly shown that the l-proline can act as a catalyst of the condensation of the inorganic network when in presence of zirconium complex. A model detailing the involvement of the l-proline in the inorganic condensation process has been proposed and suggest that l-proline provokes the formation of active zirconium oxide anions that further accelerate the condensation of both zirconium hydroxide and silanol groups into more condensed oxide species (Si–O–Zr and Si–O–Si). This is indeed this interaction between the l-proline and the zirconium centre that is on one side forming denser structures, where the l-proline is embedded, and on the other side rending the organic catalyst chemically inert, that explains its non-catalytic effect in presence of zirconium. This paper is to the first to author’s knowledge investigating the interactions between sol–gel matrices and organic catalysts with likely numerous future studies in the topic to follow. This study was funded through grants from Dublin Institute of Technology (DIT), Fiosraigh PB03930, and Enterprise Ireland, CF-2017-0687-P.